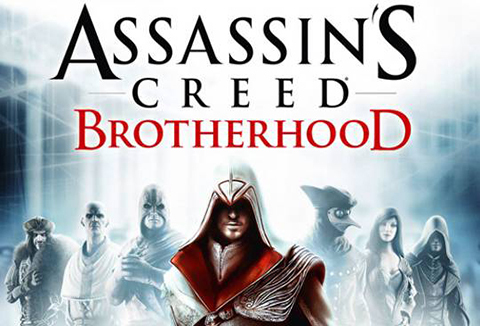 Assassin’s Creed Brotherhood is the third game in the AC series by Ubisoft and the second game in the story of Italian assassin Ezio Auditore da Firenze, and on many levels the game is purely a success at what it sets out to achieve. ACB is really a game of two parts though, the stunning single player campaign that started in the first AC and continued into AC2 continues here, but now Ubisoft has created a multiplayer experience, that to be honest, at first I was highly skeptical of. To be fair I am splitting this review up into two separate parts, one for single player and the second for multiplayer. The campaign starts off with Desmond Miles and his group of modern day Assassins of the Order. The group, who is on the run from Abstergo, end up hiding out in the Assassin’s Cave in Ezios old home of Monteriggioni. Once set up in the Assassin’s Cave, it’s time for Desmond to once again enter the Animus and become Ezio, the main character from AC2. The group is still on the hunt for the Apple of Eden and need to find it before the Templars and Abstergo do. That’s the jist of ACB, basically a continuation of the story in AC2, except this time, Ezio is headed to Rome. Unlike previous entries in the series, ACB takes place entirely in one city, Rome. Rome is a pretty big place, but despite that, it never really feels like it’s a long way off to get across town. Of course there are guards a plenty scattered throughout Rome and this is what brings me to my first complaint about the game. In ACB, unlike the other two games, you can ride horses in the city. You can ride a horse pretty much anywhere you want to go on one. My problem though has to do with the speed of the horses. Even at a full gallop the only time a horse actually feels faster is if you’re on one of the current plot missions, and it’s part of the story. Any other time and you can actually run faster than the horse you ride. What makes this really frustrating is when you are getting chased by guards and you jump on a horse to make a quick getaway. I actually had guards on foot run me down and yank Ezio off his horse. Really this is kind of a minor issue, but just one that kept coming up on me. ACB does do a bunch of rehashing in the campaign despite the fact they give it a different name. Most of the missions are roughly the same type as before, but the excellent story writing makes all the difference and the game never feels stale or stagnant when you are doing the main quest missions. The side quests on the other hand are not nearly as exciting. They involve the same old go here and kill this guy, or my least favorite, the beat this guy at the freerunning race time he set. These side missions roughly double your playing time in the campaign as I clocked in around 15 hours total while doing all the side missions. The problem with the side missions is that there seems to be so many more of them than the story missions, to the point that you almost forget about the story when trying to do them all. I would have much preferred fewer side missions and more story missions of relevance. This brings me to the most peculiar set of the campaign that I found in the entire game. The “Christina” missions. Christina Vespucci is the woman that Ezio snuck off to see in the pre assassin Ezio start of AC2, and these missions seek to flesh out that relationship during ACB, as flashbacks to before Ezio came to Rome. The only problem with this is that the missions feel kind of tacked on and don’t really lead to anywhere or mean anything other than a small amount of background info. They are not required missions and are just another side mission that prolongs the game. If the Christina missions were longer and had more story relevance I would probably feel differently about them, but when the very short last one takes place, it doesn’t evoke the emotional response that it should, and to say I was a little disappointed is a bit of an understatement. The biggest difference to ACB from previous entries is that about a quarter of the way into the campaign, you gain the ability to get assassin recruits that are able, through experience, to become fully fledged Assassins of the Order. This recruitment is actually handled in a really neat way during the campaign. At one point you will be told to rescue villagers from Borgia guards that can be recruited into the order. Going to your map will enable you to find multiple places that villagers are fighting back and after defeating the attacking guards you can talk to the villager and recruit them. From here out you have the option of either sending them off to other cities on missions, which they will bring back gold and sometimes items as well as gain needed experience, or keep them in Rome with you to attack guards as you need them. I found this part of the campaign incredibly refreshing and at one point, I actually enjoyed sending my recruits off on missions more than playing moving the story along. As your recruits level up they are able to upgrade their weapons and armor and they gain new abilities like the hidden pistol and smoke bombs. When this really begins to play out in your favor is in later missions when you have enough recruits, you can call in an arrow storm from off screen with just the push of a button, and all your enemies in the immediate area are killed. Of course when your recruits earn enough experience to become full Assassins, there is a cool feeling of accomplishment. There is one other thing I want to bring up. ACB and AC as a series, is not the only group who is guilty of this, but the dramatic camera angle needs to go. The puzzles of ACB require lots of climbing and jumping, just as the previous two games did. There is nothing more frustrating than being in a puzzle and having the camera switch to such an angle that you no longer have any idea which way to press on the controller to go the direction you want to go in. There was quite a few times when I would be happily finding my way through a puzzle, knowing which way I was supposed to go, only to have the camera angle change suddenly on me to the point where pressing the direction on the controller I thought was right, was actually wrong and you end up missing some jump and having to start all over again. Repeat this 20 times in a row and it gets to be frustrating as hell. It reminds me of some of the old Prince of Persia games where it became “run blindly here and jump and hope you don’t die” except this time you’re not blind, just confused by some strange camera angle that it was decided needed to be put upon you at that exact moment. It’s not game breaking but at the time it can really piss you off. Other than the few minor issues I had, the campaign in ACB is pretty good. The story as usual is excellent if a bit short, but does a good job of moving the story of Ezio along. If you played the first two AC games and enjoyed the story I would highly recommend you play through this entire campaign, just don’t be overly concerned with side missions. If your new to the AC series then by all means dive in and see what hiding in hay bales is all about. When I first heard ACB was going to have multiplayer added to it of course I said no, don’t do it, it doesn’t need it, etc, etc. I was skeptical to say the least. Here was a successful series that had made a name on its single player campaign and story that was going to add a multiplayer element just to be like everyone else. That’s what I though and boy was I wrong. Multiplayer in ACB is not like much anything else you’re out there playing. To start off instead of being part of the Assassin’s Order, you’re an Abstergo employee now, basically a Templar, and this is your training to be able to go after the Assassins. That’s just the start, because you’re basically playing to assassinate another player, while the entire time another different player is trying to assassinate you. Sound complicated? It’s actually surprisingly simple and a whole world of fun to play in. Multiplayer works by assigning you a contract to kill someone, another player. You need to track that player down with your radar that is a circle that has a wedge in it that gets bigger the closer you get to your target. You also have a picture of what your target looks like. The idea is to kill your target as stealthily as possible to get the most points for the kill. Whoever has the most points at the end of the round wins the round. What makes it hard is that when you get close there may be five other people around that look just like your target, and you need to figure out which one you need to kill. Killing the wrong person, an innocent, cause you to lose the contract but worse, exposes you to the person who has a contract on you. If that person is nearby, and odds are they will be, you basically just threw up your hands and said here I am, come get me! That’s when the next exciting part of ACB’s multiplayer comes in. The chase and try to escape before you get killed yourself part. A big warning icon suddenly pops up on screen telling you to get the hell out of there and fast. It’s then up to you to use all your freerunning skills to run, climb and jump your way to losing your chaser, and then still finding a hiding spot to sit in until the cooldown meter says your ok to come back out and play. All this leads up to very exciting moments of cautious stealth and frantic escapes as you try to kill and evade your way to victory. It doesn’t seem to really matter where you go or what you do, you are never totally hidden and your prey is likewise. All in all, the multiplayer makes up for the campaign feeling on the short side, and delivers an added bonus to continue on with ACB after you finish the story, which is a good thing, because, no matter how good the story in the campaign is, once it’s done, it’s done. And in a time when it seems like every other game out there is tacking on multiplayer whether its good or not, Ubisoft and ACB offers up a nice refreshing change of the constant run and gun you see everywhere else.